They also do some great kazoo harmony. My name is Timothy ###, and I am a soldier in the United States Army. I am currently serving overseas in Iraq. My wife’s cousin knows how much I love Kazoos, so she sent me some great kazoos and a t-shirt. I took the opportunity to start up a kazoo band and got a picture of us in action. Thanks for the great kazoos and for the countless hours of fun they bring! It was a pretty sweet morale booster! Thanks again! 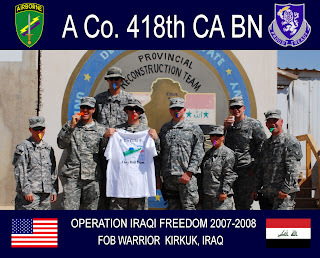 Kazoobie Kazoos is proud to be a part of boosting the morale of our soldiers in Iraq with our kazoos. Captain Kazoo has created the World's Largest Playable Kazoo. It's 50" Long, 18" High, and 12" in Diameter. Now mounted in the Kazoo Mobile, this giant kazoo is on display at Captain Kazoo's events. Captain Kazoo also maintains what is likely the World's Largest Kazoo Collection which is on display in his on line Kazoo Museum.